Being a trained chef who prior to getting an expensive education read and studied cookbooks for fun means that I now infrequently use such books. Although I do turn to them when needing some new pointers, or a very popular or famous chef compiles their favorite original concoctions along with personal anecdotes and now as a technophile I actually checking out cookbook apps and software when I can or when offered a look. I have tried out Better Homes and Garden’s, Cooks Illustrated and more, and the biggest issue I found in them was that you have to have an internet connection always running to get to the recipes. Yes, we are talking about iPhone/iPad apps so the idea that you’d be offline is pretty crazy, but what if you’re doing a barbeque in the Ozarks and for one second you decide… “Hey, this potato salad is so boring… what else can I do with potato salad?” and in this imaginary situation you have access to any food or food item you want, but no internet and you’re flavor profile mind isn’t just kicking in. So an app which you can download recipes to before you head to the Ozarks is best right?I’ve been sampling a few that were okay, but had many flaws I didn’t care for and have missed a few that fascinated me but were truly out of my price range and there’s some that haven’t come out yet. There are a variety of interesting celebrity sponsored apps such as ones from excellent chefs and television personalities like Gordon Ramsay and Jamie Oliver and when looking for something very specific they come in handy. There’s even a version of Mark Bittman’s “How To Cook Everything”, but that is much more a guidebook to cooking and less so a cookbook collection. That’s what the app iCookBook can help with. Although it’s much more than that. In terms of layout and design I’ve liked it much more than any of the others. I wouldn’t necessarily say they’re the best of the recipes though, despite being many of them and I mean any. The collection is of all Brand name recipes, things from boxes of products ranging from Kraft, Hershey’s, Pace, Wish-Bone and more. Of course you wouldn’t have to use the name brand product if trying a recipe, you could use something similar and probably get the same results. 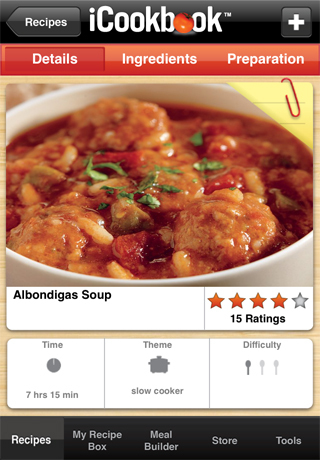 The app has monthly free downloads adding new recipes along with optional paid recipe options based on themes and styles. The setup is as easy as many, you get your ingredient list and then follow very simple instructions. You can find recipes via filters such as method of cooking, theme, time of creating the dish, theme of the dish, and more. For someone like me I’d be using it as just a pointer, but it’s definitely a good pointer and much easier to use than any of the other apps as I said and more versatile. I wouldn’t be surprised to discover something new and interesting too, with over 2000 recipes available on download and many more there’s going to be something I didn’t ever learn in school or post school studies. It also has easy access to items such as conversion charts and substitutions, the ability to create a shopping list and offers customer service. 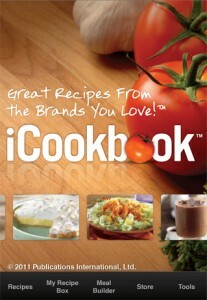 iCookbook is a universal app designed to work on iPhone and iPad equally and is available for $5 which is cheaper than any cookbook that would be on this collection. It is also available for Android, HP Touchpad and Windows 8. Wizard Rock Will Live Forever!